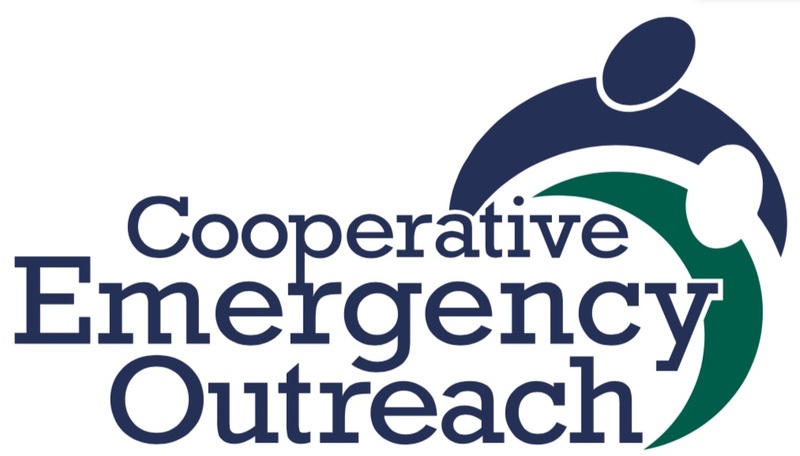 Cooperative Emergency Outreach provides emergency assistance to residents of Washington County, AR, living in Fayetteville, Cane Hill, Elkins, Farmington, Greenland, Goshen, Lincoln, Prairie Grove, Summers, West Fork, and Winslow. We regret that we are unable to serve clients living outside of this area. We invite you to browse our site and learn about CEO, what we are doing in our community, and how you can help. Twelve hours of giving is NOW. April 4! 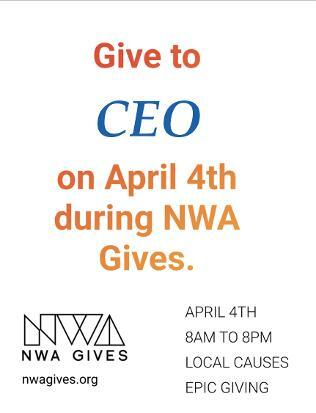 Please consider donating to CEO https://nwagives.org/CEO/ today between 8 a.m. and 8 p.m. during the NWA gives fundraiser. Our goal of $5000 can be reached with just 200 donations of $25 each. Click here to go directly to the site for giving to CEO. Our goal on April 4 is $5000! Volunteers Needed! We need volunteers-interviewers are always needed, other positions are also available. If you are unable to work during the week, consider being a Saturday volunteer on the first Saturday of the month. To learn more about volunteer opportunities, contact your church representative, or email us. Additional Hours! CEO is open from 10-12 the first Saturday of each month. This will enable us to better assist clients whose employment makes it difficult for them to be at our office during the week. 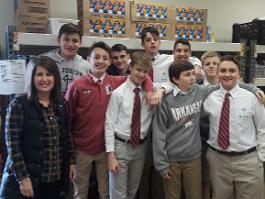 It is only with the support of its member churches and the NWA community that CEO is able to do what it does for those of our neighbors needing help. Last year we provided food for 10,302 individuals, and over $150,000 was spent in assistance for rent, utilities, and transportation. 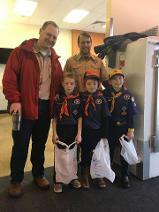 It is gratifying that often much of that help comes from some of the junior members of our community. 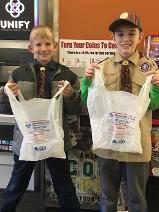 Pictured below are (left and center) members of Cub Scout Pack 40 who collected 250 pounds of food and $111 in donations at Harp's Grocery on Crossover Rd; (right) a group from Emmanual Lutheran Churchbagging chicken; (bottom row) two groups of students from St Joseph's School, who spent a morning bagging beans, rice, pet food, and stocking shelves. 1 Use the Donate button to make a one time gift. After you enter your card information you will have an opportunity to "add additional instructions" if this is a gift in honor or memory of someone. 2 Use the Subscribe button to set up a monthly donation of $10, $15, or $20. You do not need a Paypal account to donate securely using your credit or debit card. Your donation will appear on your bill as Paypal*Cooperative. Contributions to CEO are fully tax deductible to the extent allowed by law. You may also donate by mailing a check to: PO Box 3631 Fayetteville AR 72702 Contact us if you would like to make a donation of securities. Your shopping makes a difference. Do your regular Amazon shopping at smile.amazon.com/ch/71-0695376 and Amazon donates to Cooperative Emergency Outreach. CEO will be closed on days the Fayetteville schools are closed due to inclement weather. 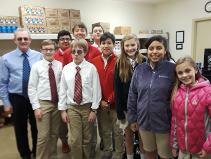 CEO provided food to 10,302 clients. 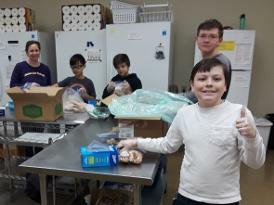 The biggest month was January when we helped feed 1140 people. Rental assistance was almost $38,000. Utility assistance was over $75,000. $22,500 was used to assist clients for rent. $22,000 was used to assist clients with gasoline. $14,000 was used for vouchers to area thrift stores, primarily for clothing. At least 300 people view this CEO web site each month. Over 100 volunteers provided 6898 hours of service. There are no paid staff members.